Four times today the Hungarian government had to revise the appointed hour of the Orbán-Putin press conference. At last the great event took place close to 8 p.m. Putin arrived late in the first place. Instead of 2 p.m. he landed at 3:20. Just to give you an idea of the scale of this visit, the Russians came with eight planes and carried along 30 some cars to protect Vladimir Putin’s armored limousine. Putin’s convoy moved to Heroes Square and from there to the Russian military cemetery. Let’s pause here a bit because this cemetery became the object of great interest. Buried in most of the thousands of graves on this site are soldiers who died during the siege of Budapest during the winter of 1944-45. In addition, there are graves that belong to soldiers who died during the revolution in October 1956. In the cemetery there are monuments to their heroism during “the counterrevolution.” Most likely not too many people noticed these forgotten relics, which survived the regime change. But now, especially since belittling the greatness of the 1956 revolution is a punishable offense, most anti-government commentators are appalled. How is it possible that the Hungarian government didn’t manage to impress on the Russians that calling 1956 a counterrevolution is a sensitive issue in Hungary and that the inscriptions should be changed to something more neutral? After all, Boris Yeltsin apologized for 1956 and one would think that the new “democratic” regime in Russia no longer considers the Soviet intervention in 1956 justifiable. It turned out that Csaba Hende, minister of defense, suggested a change but to no avail. Knowing Vladimir Putin’s attachment to the Soviet past, I’m certain that he in fact considers the uprising in Hungary a counterrevolution. So, it’s no wonder that some of the speakers at yesterday’s demonstration denounced Viktor Orbán’s friendship with Putin as a desecration of Hungary’s proudest moment in the last century. Especially since Viktor Orbán claims pride of place in the events that led to a democratic regime thirty some years later. As for the topics discussed by the two leaders, the public learned very little. On the Hungarian side almost no information was revealed. The little we learned was from Russian sources. According to one source, sputniknews.com, Yuri Ushakov, presidential aide to Putin, informed the paper that the 1998 gas contract that expires this year will certainly will be discussed. He also indicated that Putin would discuss an alternative to the Southern Stream. Otherwise, fairly mundane topics were on the agenda. Opposition circles guffawed over the news that Hungary will open a third consulate in Kazan, capital of the Republic of Tatarstan. Five agreements were signed: on regional economic cooperation, on bilateral cooperation on healthcare issues and higher education, on the opening of the consulate in Kazan, and on the exchange of technical know-how on atomic energy issues. This last one is a first step toward building the second reactor in Paks. On the surface these are pretty meager achievements given the fanfare that preceded the visit. After the press conference Hungarian talking heads announced that Viktor Orbán hadn’t achieved anything. Putin came empty-handed and didn’t seem to appreciate Orbán’s efforts on his behalf in the face of opposition by the European Union and the United States. As I mentioned earlier, the press conference was held an hour later than originally planned. Between Putin’s arrival and the press conference more than four hours elapsed. That left plenty of time for a lengthy discussion between the two men. In my estimation Orbán had a much longer discussion with Putin than he did with Angela Merkel. If I had to judge, just on the basis of Orbán’s countenance, I would say that the Hungarian prime minister’s conversation with Putin went a great deal better than his conversation with Merkel did. At least from his point of view. Orbán certainly made sure that he would in no way show himself at odds with the Russian position. He talked about Ukraine as little as possible, and then simply repeated his desire for peace. At what price? He did not touch on any of that. He was unctuous when he thanked Putin for the visit and stressed that his decision to come was “a great honor for us.” Hungary needs Russia because of energy. Cooperation and good relations are important not only for the two countries but also between Russia and the European Union. He emphasized the importance of “Eurasian cooperation” and expressed his delight that French leaders share his thoughts on the subject. He did not refer to Paks but said that a “political agreement was reached” on the use of the gas that Hungary had contracted for but had still not used. Hungary will be able to use this considerable amount of gas over the next few years instead of paying for it before the expiration of the contract. This “guarantees the future of Hungarian industry.” Unfortunately, we know nothing of the details–of the price of gas or the duration of the new contract. According to Magyar Nemzet, it is unlikely that Hungary will be able to purchase natural gas from Russia cheaper than, for example, Germany, a country that is not so heavily dependent on the Russian supply. 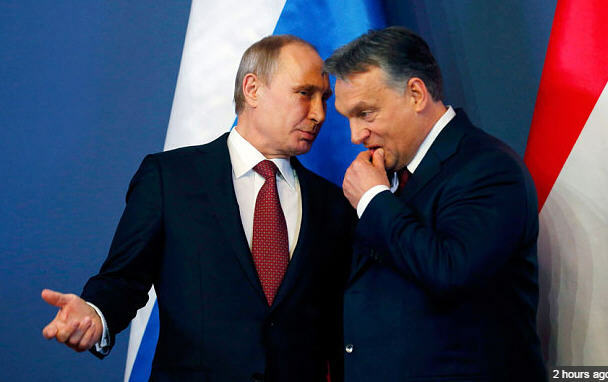 From Putin’s short speech we at last learned that it was, after all, Viktor Orbán who invited Putin to Hungary, a point of debate among Hungarian political observers. Putin talked about Paks and the 9 billion dollars Russia will lend to Hungary on very good terms. Paks will create 10,000 new jobs as an added bonus, he said. He found the talks very constructive. Putin made sure to mention that he invited Orbán to the celebration of the 70th anniversary of the end of World War II, which will take place in Moscow on May 9. Of course, Putin invited the leaders of all the countries that were involved in that war, but we don’t know yet whether, for example, Barack Obama will accept the invitation given “the deep chill in relations between Russia and the West, triggered by Russia’s annexation of the Crimea peninsula from Ukraine and its support for a rebellion in the country’s east.” North Korean leader Kim Jong-un was also invited to attend the ceremonies. Viktor Orbán had the last word. He delivered a ringing speech attacking those people “who want to shut Russia out from the energy market of Europe, a proposition [he considers] utter nonsense (badarság).” Orbán I assume was referring to the United States. It is hard to fathom why it was necessary to attack Washington, especially after Péter Szijjártó expressed his hope for improved U.S.-Hungarian relations. Orbán said he was disappointed about the demise of the Southern Stream project but announced that Hungary has been negotiating with Turkey, Macedonia, Serbia, and Greece about a pipeline through these countries. 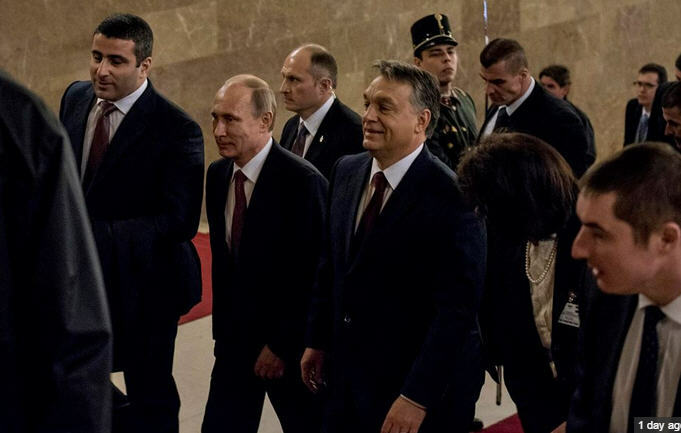 According to Orbán, Vladimir Putin “has given us encouragement” to continue these negotiations. It was not quite clear what Orbán meant by claiming that between 1998 and 2002 “awful things happened in Russia.” Perhaps this was an attempt to explain why he as prime minister during those years was such a determined foe of Russia, despite the fact that Putin became prime minister of Russia in 1999. Finally he praised Putin’s Russia as a partner one can trust. I find it significant and inspiring that the unity of effort among us has played such a critical part. Our unity on sanctions has sent a clear message to Russia, that we cannot be divided. And our collective message has also made clear that we do not accept the vision of “New Russia,” we do not accept Moscow’s explanation for the shooting down of the Malaysian airliner, we do not accept missile attacks on civilians in Mariupol, and we do not accept continued falsehoods about the recruiting, arming and equipping of separatists who are murdering and maiming innocent people including defenseless children. We say no to this. We say yes to Ukraine’s sovereignty. As you are all well aware, President Putin is in Budapest today. We could think of no better way to observe the day than to focus on our hopes for Ukraine’s sovereignty and its future, and to share those hopes with you, Mr. Yunger, among our friends and allies. Posted in Hungarian politics and tagged Angela Merkel, Barack Obama, European Union, hungarian government, Hungary, László Kéri, Moscow, Paks Nuclear Power Plant, Russia, United States, Viktor Orbán, Vladimir Putin on February 17, 2015 by Eva S. Balogh. I assume most readers want me to say something about the Putin visit, but I think it’s better to postpone writing anything more on that subject until after the meeting itself. Instead, I’ll spend some time on another “hot topic,” the extreme-right Jobbik party and recent election results. According to Ipsos, Jobbik has gained considerable strength since the beginning of 2014. And since October 2014 its rise has accelerated: it gained another 4%. At the same time Fidesz lost about 12% of its voters. Most of the disenchanted Fidesz voters moved over to the large undecided bloc. With the exception of the Demokratikus Koalíció, parties of the democratic opposition seem to be unable to capture the voters’ imagination. The fear of a Jobbik resurgence was reinforced by the party’s success at the municipal elections on October 12, 2014 when they captured fourteen mayoralty positions as opposed to the three they won in 2010. 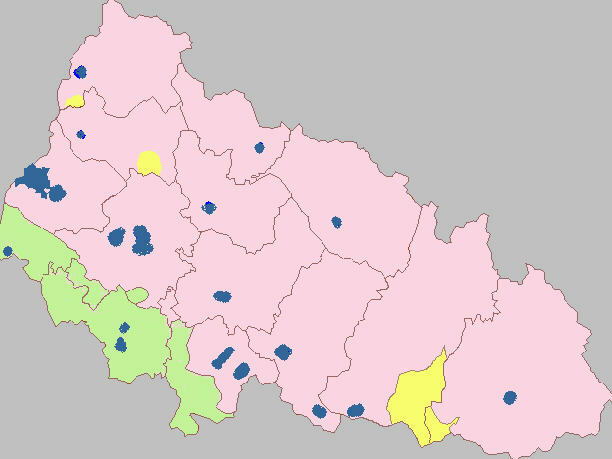 Most of the towns Jobbik won were small and insignificant on the electoral map, with two exceptions. One was Ózd, near Miskolc, where the Jobbik candidate won over the incumbent Fidesz mayor by a margin of 66 votes. The Fidesz leadership, with the blessing of the Debrecen Appellate Court, decided to contest the result. It was a big mistake. The citizens of Ózd were outraged and decided to show their dissatisfaction with the “arrogant, condescending and corrupt” local Fidesz leadership. While in October only 10,214 people voted, for the second round 15,982 showed up. Jobbik’s candidate in October received 4,214 votes. In November he got 10,299 votes. 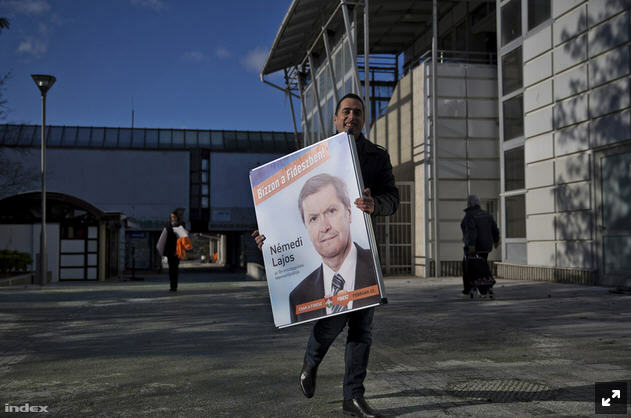 The DK-MSZP candidate in October received 2,238 votes, in November only 520. Most local citizens voted for the Jobbik candidate not because they were committed Jobbik supporters but because they were convinced that he was the only person who had a chance of unseating the Fidesz incumbent. The situation was different in Tapolca, which is located not in the underdeveloped area of Hungary where Jobbik has traditionally been strong but in the relatively affluent Transdanubia. Between 2010 and 2014 the Fidesz government had been generous to the town and funded a lot of improvements. So, even Jobbik supporters were stunned when it turned out that the Jobbik candidate, Zoltán Dobó, had unseated the incumbent Fidesz mayor in the 2014 municipal election. The margin was small, 146 votes, but the win was significant. It indicated, at least at first blush, that Jobbik was extending its influence into the better-off regions of the country. Reporters talking with locals, however, found out that some of the people who voted for Dobó didn’t know he was a member of Jobbik. So, what happened? It seems that the Fidesz mayor didn’t keep his finger on the pulse of the electorate. He shut himself off from the voters. By contrast, Dobó, a council member since 2010, kept a high profile. And then there was a local affair that stirred up deep sentiments: the fate of Tapolca’s little hospital, which the government wanted to either close or strip of most of its functions. The local Fidesz leadership naturally supported the government’s decision–until it was far too late. By that time Zoltán Dobó and Lajos Rig, another Jobbik city father, had taken over the fight for the local hospital. Apparently, that was the main reason for Dobó’s success at the polls. The town itself, which has been in Fidesz hands since 1998, still has a predominantly Fidesz city council. On the eleven-member city council Jobbik won only four seats. All in all, since the local elections held on October 12 not one Fidesz candidate has managed to win a by-election. And now it looks as if Fidesz might even lose the Veszprém and Tapolca parliamentary by-elections, which must be held because of Tibor Navracsics’s departure to Brussels and the death of Jenő Lasztovicza, a member of parliament for the Tapolca district. If either of these two by-elections is lost, Fidesz will no longer have a two-thirds majority. How serious a blow that would be to Fidesz is a matter of debate. Some commentators claim that the lack of a super majority would make no difference because there would always be some people in Jobbik who would be glad to vote with Fidesz-KDNP. Others claim that the lack of a two-thirds majority would prevent Fidesz from transforming the present parliamentary system into a powerful presidential one, with Orbán at the helm. In either case, a Fidesz defeat in one or both of these districts would give an immediate boost to the democratic opposition and further damage the governing party. Tibor Navracsics’s seat in and around the city of Veszprém will be decided on February 22, while voting in Jenő Lasztovicz’s district in Tapolca and environs will take place on April 19. A few words about the election in Navracsics’s district. Veszprém’s first district traditionally votes Fidesz. At the last national election Navracsics beat the MSZP candidate by 20% (47% to 27%), with the Jobbik candidate receiving 16%. After a lot of hesitation, Fidesz decided to nominate Lajos Némedi, the deputy mayor of Veszprém. About a week ago a secret opinion poll was taken, with surprising results. Zoltán Kész, an independent candidate supported by all the democratic parties except LMP, is doing extremely well. In fact, he is leading in the city of Veszprém, though trailing in the villages. As it now stands, Némedi has 43%, Kész 37%, Jobbik 11%, and LMP 4%. Jobbik seems to have lost voters since last April. The poll showed that the majority of the people think that the country is moving in the wrong direction (61%). Left-leaning voters are solidly behind Kész. Even 6% of Fidesz voters plan to switch their votes, and 31% of LMP voters say they will opt for Kész. Kész has a slight lead even among younger voters. Voters with only an eighth-grade education prefer Némedi (64% to 25%), but among university graduates it is 49% to 28% in Kész’s favor. In this latter group only 2% would vote for Jobbik. In the last few days Fidesz changed the campaign slogan. Earlier their orange-colored posters read “Trust Fidesz!” but it was decided not to advertise Fidesz too much. Now the poster reads: “Trust Némedi!” Meanwhile, the anti-Kész campaign is in full swing, and Fidesz is promising that fabulous government projects will be built in Veszprém if the district votes for Fidesz. We’ll see whether the voters of Veszprém take the bait. One could devote a whole series of posts to István Lovas himself, from his brush with the law as a teenager to the open letter he wrote recently to Vladimir Putin in which he asked him to start a Hungarian-language “Russia Today” because the Russian propaganda television station is actually much better than BBC. Lovas lived in Canada, the United States, and Germany, where he worked for Radio Free Europe. He was considered to be a difficult man who caused a lot of turmoil in the Hungarian section of the organization. For many years Lovas was a devoted Fidesz man. He already held important positions in the first Orbán government (1998-2002). For years he worked for Magyar Nemzet, most recently as its Brussels correspondent, but a few months ago Lovas, along with a number of other Orbán stalwarts, lost his job. Mind you, the European Parliament had had enough of Lovas even before he was sacked by Magyar Nemzet, especially after he presented a bucket of artificial blood to Sophie in ‘t Veld, the Dutch liberal MEP. The bucket of blood was supposed to symbolize the Palestinian children who were victims of the Israeli-Palestinian conflict. Lovas, himself of Jewish descent, is a well-known anti-Semite. After having lost his job at Magyar Nemzet and after Putin failed to respond to his plea for a Hungarian “Russia Today,” Lovas moved on. Gábor Széles, who owns Magyar Hírlap and EchoTV, offered him a job. Now he has a weekly political program called “Fault Lines” (Törésvonalak) on EchoTV, and he also writes opinion pieces for Széles’s newspaper. So how does István Lovas see American-Hungarian relations in the wake of the arrival of Colleen Bell and the departure of André Goodfriend? To summarize his opinion in one sentence: from here on the United States and the Orbán government will be the best of friends. These liberal hopes were dashed soon after Colleen Bell’s arrival. The new orientation was clear from day one. Bell went and laid a wreath at the statue of the unknown soldier on Heroes’ Square. She visited the Csángó Ball organized every year to celebrate a fairly mysterious group of Hungarians living in the Romanian region of Moldavia, speaking an old Hungarian dialect. These are important signs of the new American attitude toward things dear to the current government: fallen heroes and national minorities. Certainly, says Lovas, Goodfriend would never have been found in such places. Yet liberals don’t seem to have grasped the significance of all this. They think that more Hungarians will be banished from the United States and that Hungary will have to pay a high price for peace with the United States. Most likely, Orbán will have to compromise on Paks, on Russian-Hungarian relations in general, and/or will have to buy American helicopters. But Lovas has bad news for them. There will be no more talk about corruption cases, and Hungary will pay no price whatsoever. Colleen Bell realized that Goodfriend’s methods had failed. Of course, Lovas is talking nonsense here. Even if Lovas is right about a change in U.S. policy, it was not Bell who decided on this new strategy but the United States government. Lovas is certain that the change has already occurred. It is enough to look at the new website of the U.S. Embassy in Budapest. There are no more programs on tolerance, on Holocaust events, “all those things that are kicks in the groin of the Hungarian people and their elected government.” A drastic change occurred in U.S.-Hungarian relations which even such liberal-socialist diplomats as Péter Balázs, foreign minister in the Bajnai government, László Kovács, foreign minister under Gyula Horn, or András Simonyi, ambassador to Washington (2002-2010), couldn’t explain away. This change couldn’t have taken place if Goodfriend had stayed or if the Orbán government had conducted “the kind of servile atlantist policy recommended by Géza Jeszenszky,” foreign minister under József Antall and ambassador to Washington during the first Orbán government. Jeszenszky, who just resigned as ambassador to Norway, had a long interview in which he expressed his deep disappointment with Viktor Orbán and his foreign policy, especially with his attitude toward the United States. According to Lovas, what happened recently is a victory for Orbán’s foreign policy, a feat that “could be achieved only by the courage and tenacity” of the Hungarian prime minister. The United States government tried to mend its ways by sending someone to Budapest who is not worried about such things as tolerance or the Holocaust. From here on the Budapest embassy will function just as American embassies do in other capitals. The U.S. Embassy in Vienna, for example, does not report “breaking news” about the Anschluss. I’m sure that we all want better relations between Hungary and the United States, but the question is at what price. The United States can’t close its eyes to Viktor Orbán’s blatant attacks on democracy, the media, human rights, and civil society. And then there is the timing of this alleged renewed love affair between Budapest and Washington. If true, and that’s a big if, it couldn’t have come at a worse time for Hungarian democracy–yes, liberal democracy. Just when Viktor Orbán’s support is dropping precipitously and when it looks as if he may lose his precious two-thirds majority in spite of all the billions of forints he promised from taxpayer money to the city of Veszprém to buy votes. When a large part of the hitherto slavish right-wing media at last decided to return to more critical and balanced journalism. Viktor Orbán has been a very busy man lately, especially when it comes to playing on the international stage. Angela Merkel visited Budapest last week; this week Orbán had talks with the prime minister of Georgia, and today he traveled to Kiev for a brief visit with Petro Poroshenko. Orbán’s Ukrainian visit is widely seen as an attempt to counterbalance the much criticized Putin visit next Tuesday. Today much of his regularly scheduled morning interview was devoted to Russian and Ukrainian affairs. There is still no verbatim transcript of the interview, but I took notes when I listened to it and read several summaries that appeared in Hungarian newspapers and on the government’s website. Some of his comments on the Russian-Ukrainian conflict were platitudes about the dangers of war so close to home. Surely, Hungary is much more exposed than France or Germany, whose heads of state tried to broker an agreement with Vladimir Putin in Moscow. Orbán, who remains opposed to further sanctions, tried to put the best spin on the “fragile peace” that is still better than war. When it came to Russian-Hungarian relations, Orbán treaded lightly and felt compelled to refer to Hungarian leeriness when it comes to relations with Russia. Mind you, the reference was fleeting. He said that “for many Hungarians this is an emotional issue.” One would have thought that either he would have stopped there or would have explained Hungarian reservations by talking about the role of the Russians in the 1848-1849 war of independence and, naturally, about the Russian suppression of the 1956 Hungarian revolution. But no, he said instead that “we lost a war against them,” referring to World War II. A most unfortunate remark since winning the war against the Soviet Union in this case would have meant victory for Nazi Germany. Magyar Nemzet might be moving in the right direction as far as honest journalism is concerned, but it decided to omit this sentence. In his opinion, emotions cannot play a role in Hungary’s relations with Russia. He himself never had any doubts about Vladimir Putin’s visit. It was he who invited Putin, and he is glad that Putin accepted his invitation. The Russian president is always welcome in the Hungarian capital. It is becoming apparent to me that Viktor Orbán imagines today’s Europe as similar to the way it was between the two world wars. The simultaneous collapse of the large, powerful empires of Germany, Austria-Hungary, and Russia allowed the formation of small nation states in the region of East-Central Europe. With the revival of Germany and Russia, these states found themselves squeezed between Nazi Germany and the Soviet Union. Orbán keeps talking about the “two large powers,” Russia and Germany, on whom Hungary depends for its well being. But this is an outdated view. Today there is a European Union to which Hungary belongs. Hungary also joined NATO. Hungary is definitely committed to the West and her security lies on this side. Balancing between two world powers is no longer possible, and therefore I’m convinced that Orbán’s “brilliant” strategy will be a failure. Orbán’s diplomatic balancing act leads me to another topic, the departure of M. André Goodfriend from Budapest. The announcement was a surprise because the United States government had explicitly stated that Goodfriend would remain in Budapest even after the arrival of Colleen Bell, the new U.S. ambassador. The chargé represented U.S. policies and worked closely with the State Department. It was a message to Budapest that no great changes in U.S.-Hungarian relations should be expected with the arrival of the new ambassador. But then came the bombshell that after all Goodfriend is leaving “for strictly family reasons.” Hungarians suspect that this explanation was fabricated, that some kind of a deal was reached between Washington and Budapest for which the U.S. government sacrificed Goodfriend. Well, I’m one of those people who don’t believe this conspiracy theory. First of all, the one longer speech that Colleen Bell delivered to date in no way indicated a softening of the American attitude toward the Hungarian government. The speech was delivered before businessmen, and therefore she concentrated on economic issues. She brought up a point about which foreign businessmen complain: the unpredictability of Hungarian economic policy. Second, I see no sign of any softening of Orbán’s attitude either on the Russian issue or on the question of corruption. As for the attacks on nongovernmental organizations, the verbal abuse continues. If there was a deal, it was one that the Hungarian side is not honoring. And I refuse to believe that American diplomats are so naive as to strike a deal before the other side takes concrete steps to mend its ways. So, I’m inclined to accept the Embassy’s version that Mr. Goodfriend has some very urgent family business that can be taken care of only in the United States. 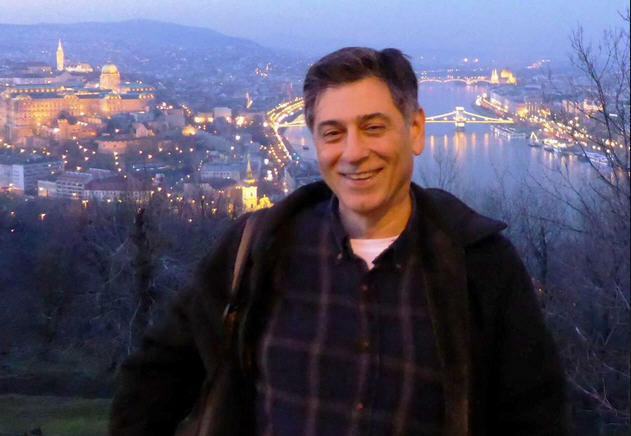 André Goodfriend’s departure is greeted with great sadness in liberal circles in Hungary. Many looked upon him as a valued friend of Hungary and were extremely grateful to him. On Facebook there are thousands of posts in which Hungarian citizens thank him for being the defender of Hungarian democracy. I heard a story about one gesture that exemplifies the kind of gratitude Hungarians felt. It was Christmas Eve and André Goodfriend went to a flower shop to buy a bouquet. When he wanted to pay, the owner of the flower shop wouldn’t accept his money, saying that it is she who owes him instead of the other way around. Perhaps the most moving manifestation of the affection felt for André Goodfriend in Hungary is a video sent by Kreatív Ellenállás (Creative Opposition), a Facebook group, to which the creators added a popular song entitled “André j’aime” composed by János Bródy, played by the Illés Ensemble and sung by Zsuzsa Koncz. These people are legends in Hungarian popular music, mainly because their songs were highly critical of the Kádár regime. Finally, Mr. Goodfriend was a regular reader of Hungarian Spectrum and a few times even engaged in our discussions. We will miss him, and I’m sure I can speak on behalf of our readership in wishing him the very best in his future endeavors. Elemental rearrangement on the Hungarian right? Over the past few years we often heard that the regime Viktor Orbán built in the last five years can be dismantled only from the inside. Internal dissatisfaction with the leadership will one day reach such proportions that it will force the retirement of Viktor Orbán and his closest associates. Until recently, however, we didn’t see any such movement within Fidesz, despite its steady loss of sympathizers and supporters. We do know that there are insiders, including Fidesz members of parliament, who would like to get answers to their questions and who complain to reporters that they have been waiting a long time for an opportunity to discuss the problems the party is facing, without any success. Still and all, I don’t see any serious cracks in the solid political wall of Fidesz. The right-wing media is another matter. Although some talking heads predict that the Simicska affair will blow over in no time, I disagree. I believe that the Simicska-Orbán falling out will have serious repercussions in the media world, signs of which have already appeared. 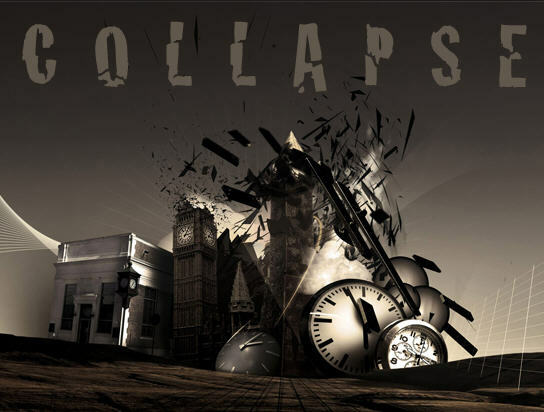 My bold prediction, admittedly mixed with a large dose of wishful thinking, is that the fomentation in the media will facilitate the collapse of the Orbán-led political edifice. On what do I base this prediction? First of all, there are signs that Lajos Simicska means business. He will use his considerable talent and financial resources to build a media empire that can take on state television and radio, a task that is, let’s face it, not terribly difficult. He began by appointing Péter Tarr to be one of the directors of HírTV. Tarr worked for Radio Free Europe until 1994 when he moved over to MTV. In 1997 he became the first managing editor of RTL Klub. In that capacity he was influential in exposing some of the corruption cases of the 1990s. According to Esti Újság, Tarr is gathering a fantastic staff at HírTV that should be able to produce the best news television in Hungary. The plan is to produce a program that “would restore the pillars of democracy and the power of the media.” Well, one could say that this is far too optimistic a scenario and that Simicska is not the most obvious man to lead the fight for democracy and against corruption. Admittedly, but he seems determined to ruin his old friend Viktor Orbán. People who know both men, like Gábor Fodor, a former friend from college days, are certain that this fight will last until only one of them is left standing. So, what are the signs that encourage me to predict real changes on the mediascape? First of all, the report from the far-right wing media that half of the reporters of Magyar Nemzet and HírTV had quit turned out to be premature. For instance, Szabolcs Szerető, one of the people who quit last Friday, has already changed his mind and returned to the fold. He was the editor of the Monday edition of the paper. The same is true of Zsuzsanna Körmendy, who used to write the most vicious editorials about the opposition and was always supportive of the government and Fidesz. Zsolt Bayer predicted that “everybody from Csaba Lukács to Zsuzsanna Körmendy will quit because they will not be ready to write articles” demanded by Simicska. Yet today Körmendy wrote a piece titled “Self-examination never hurts.” Here Körmendy confronts her readers with the steady decline in Fidesz support and calls on the party “to examine its decisions thoroughly.” From here on the government should make wiser and more thoughtful decisions because “there is nothing more pitiful and destructive than taking back in full or in part earlier decisions. One ought not to experiment with citizens who have been losing their patience.” This kind of language is new in Magyar Nemzet. So it’s no wonder that Policy Agenda, a think tank, is certain that “after five years of governing Fidesz has lost its media,” which will be deadly for the future of the party. But that’s not all. The most faithful Gábor Borókai, editor-in-chief of Heti Valóság, who served Viktor Orbán’s government as its spokesman between 1998 and 2002, stood by Lajos Simicska and against his former boss in an editorial that appeared today. For Borókai it is obvious that with the Simicska-Orbán duel “an unpredictable tectonic shift began that will turn into an elemental rearrangement on the right.” According to him, that kind of change has been long in coming. In plain language, the performance of the third Orbán government is dismal. In the past year Viktor Orbán has been preoccupied with his balancing act between Merkel and Putin while at home everything is falling apart. People have had enough of a government that wants to rearrange every facet of their lives. They want to be left alone. Of course, Borókai is still a man of the right, but not the kind that Orbán surrounds himself with these days. He is yearning for the “western, strong, sovereign and ‘polgári’ Hungary which Viktor Orbán wanted to build in 1998.” In 2010 Orbán set out to fulfill this wish, and he did rebuild a devastated economy, but “since then everything around us has changed for the worse. While searching for new solutions one shouldn’t forget the original goal. Otherwise, the chandelier will fall on us.” Borókai’s piece is full of contradictions, but it must be difficult to admit that his assessment of Viktor Orbán and his ideology has most likely been wrong all along. Even in 1998 when he decided to represent the first Orbán government. At one point he claims that “it is not too late” for Fidesz to find itself, but elsewhere he talks about an elemental reorganization of the right. Eventually these right-wing journalists will sort out their ideas, but at least they have begun writing as individuals instead of media servants of the government. Meanwhile Reporters Without Borders published its World Press Freedom Index, 2014. In the last four years Hungary’s ranking dropped from 23d to 64th out of 180 countries. While the situation in Poland, the Czech Republic, and Slovakia is considered to be good, in Hungary there are “noticeable problems.” Even the Romanian press is freer than the Hungarian. Hungary is in the cluster with Croatia, Serbia, Kosovo, Macedonia, Greece, and Albania. Nothing to be proud of. But perhaps there will be a revolt of the right-wing journalists and with it will come a freer press and perhaps even political change. A few days ago an article appeared in Foreign Affairs with the somewhat sensational title “The Hungarian Putin? Viktor Orban and the Kremlin’s Playbook,” written by Mitchell A. Orenstein, Péter Krekó, and Attila Juhász. Orenstein is a professor of political science at Northeastern University in Boston and an associate of the Davis Center for Russian and Eurasian Studies at Harvard University. Krekó and Juhász are associates of the Hungarian think tank Political Capital. The question the article poses is whether Hungary entertains any irredentist plans as far as her neighbors are concerned, similar to the way in which Russia behaved earlier in Abkhazia and now in Ukraine. After all, the Russian attacks on those territories were preceded by a grant of Russian citizenship to Ukrainians and Abkhazians. To this question the answer is negative. Viktor Orbán may sound bellicose at times, but he is interested in the Hungarians living in the neighboring countries only as a source of extra votes and perhaps a reservoir of immigrants to a country with dismal demographic figures. The authors claim, however, that there is “a delicate balance [which] could easily topple.” What created this delicate balance? Although “Hungary’s radical right-wing, fascist, and irredentist party, Jobbik, has virtually no support among Hungarians abroad,” it is still possible that “aggressive separatist political movements, especially those with external political support, could … act as though they have a majority beyond them, as in eastern Ukraine.” I must say that the exact meaning of this claim is unclear to me, but the authors’ argument is that the “nationalist political use of Hungarians abroad in Hungary could set the stage for such extremism and instability in neighboring countries.” In Ukraine such a danger is real “where Orban has taken advantage of political chaos to press Hungarian minority issues … in the sub-Carpathian region of western Ukraine, adjacent to Hungary.” There are far too many “ifs” here, but it is true that Orbán did announce his claim to autonomy for the Hungarian minority at the most inappropriate moment, during the first Russian attacks on eastern Ukraine. Or, there is the Russian nationalist ideologue, Aleksandr Dugin, the promoter of a Russian-led “Eurasian Empire” that would incorporate Austria as well as Hungary, Romania, Serbia, and Slovakia. Although Dugin’s specific recommendations were first reported on a far-right Hungarian site called Alfahir.hu, the news spread rapidly beyond the borders of Hungary. Dugin is an enemy of nation states and would like to see the return of empires. “If, let’s say, Hungary, Romania, Serbia, Slovakia, or perhaps even Volhynia and Austria would unite, all Hungarians would be within one country. Everything would return to the state that existed before Trianon.” Of course, Dugin’s argument is specious. Surely, a United Europe offers exactly the same advantages to the Hungarian minorities that Dugin recommends, but without the overlordship of Putin’s Russia. One could discount these suggestions as fantasies, but something is in the air in Russia. 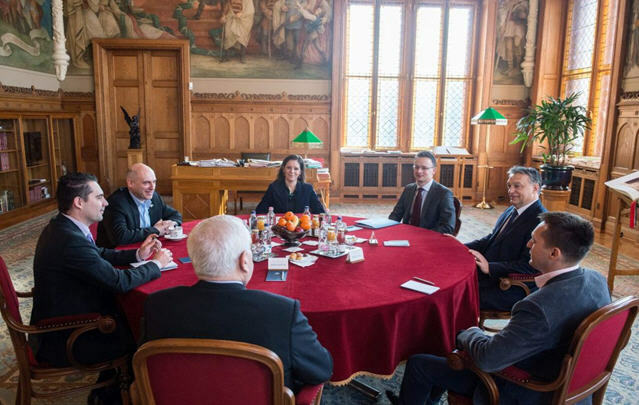 The country’s foreign minister considers the fate of the Hungarian minority in Ukraine to be of such importance that at the Munich Security Conference a couple of days ago he spent a considerable amount of time on the minority’s grievances. Mind you, Sergei Lavrov’s speech was met with derision by those present. As the reporter of Bloomberg described the scene, the “crowd laughed at and booed him.” Apparently, during his 45-minute speech he “rewrote the history of the Cold War, accused the West of fomenting a coup in Ukraine, and declared himself to be a champion of the United Nations Charter.” From our point of view, the most interesting part of the speech was the time he spent on the Hungarian minority in the Zakarpattia Oblast. [The Ukrainians] are probably embarrassed to say it here, but now Ukraine is undergoing mobilization, which is running into serious difficulties. Representatives of the Hungarian, Romanian minorities feel “positive” discrimination, because they are called up in much larger proportions than ethnic Ukrainians. Why not talk about it? Or that in Ukraine reside not only Ukrainians and Russians, but there are other nationalities which by fate ended up in this country and want to live in it. Why not provide them with equal rights and take into account their interests? During the elections to the Verkhovnaya Rada the Hungarian minority asked to organize constituencies in such a way that at least one ethnic Hungarian would make it to the Rada. The constituencies were “sliced” so that none of the Hungarians made it. All this suggests that there is something to discuss. Perhaps the most “amusing” part of the paragraph Lavrov devoted to the Hungarian and Romanian minorities in Ukraine is his claim that fate was responsible for these ethnic groups’ incorporation into the Soviet Union. I remember otherwise. The Soviet government kept the old Trianon borders without any adjustments based on ethnic considerations. The ethnic map of Zakarpattia Oblast shows that such an adjustment shouldn’t have been too difficult a task. The small Hungarian minority is obviously being used by the Russians to further their own claims, which in turn might encourage Viktor Orbán to pursue his quest for autonomous status for the largely Hungarian-inhabited regions of the oblast. The Orbán government supports autonomy for the Szeklers of central Transylvania despite the Romanian-Hungarian basic treaty of September 1996 that set aside the issue of territorial autonomy, to which Romania strenuously objected. The treaty had to be signed because NATO and EU membership depended on it. The Ukrainian situation is different because Ukraine is not part of the EU. Whether Orbán will accept the tacit or even open assistance of Russia for the sake of the Hungarian minority in Ukraine remains to be seen. In any case, to everybody’s surprise Viktor Orbán will pay a visit to Kiev where he will meet with President Petro Poroshenko.